I really do not understand Ferrari. Most of my predictions concerning the team over the past couple of years seem to be coming true - but I'm not kidding myself, I do not understand why the Italian team behaves in the way it does. It is not as if they could not do what I do - look at their history and deduce from it how they will react in each situation - so why do they continue to repeat the apparently irrational mistakes of the past? The dispersal of the dream team - Schumacher, Brawn, Todt, Byrne and even Stepney - gave Ferrari only two ways to go: either they could create a second combination of outstanding talents to mimic the blueprint provided by those who had departed, or they could return to the chaos of the empty years. The first option was probably impossible (no obvious candidates for each job spring to mind), so it was easy to suggest that they would become the Ferrari of old once more. So far, so good - we saw the beginning of the decline last year in the disappearance of the reliability that has become expected in the previous decade and in a series of inexplicable tactical decisions and farcical pitlane incidents. The Australian GP merely confirmed that the decline continues. What I do not understand is the loyalty the team generates in its employees. The rumors of Michael being forced out, rather than retiring of his own free will may be incorrect, but it still strikes me as odd that the man should be still kicking his heels around the team. After a year of not really knowing what to do with him, the team has given him a job as a sort of occasional test driver - meaning that they are still unsure how to use his undoubted experience in a sensible way. Why does he hang around as though he has nothing better to do? Then there is Jean Todt, the man who stayed on despite the pressure to get lost and who tried to minimize the effect of the changes through 2007. His ultimate extraction from the team to Ferrari CEO lasted so brief a time that Luca's statement that Todt had accomplished all his goals as CEO was just laughable. Obviously he intended only to pick up a few pay checks before leaving. Again, the stories of political strife behind the strange saga of Todt's career moves may be wrong, but there remains this odd loyalty to the company that does not seem to sit well with the man's last twelve months with the team. They say he is in Sepang purely coincidentally, but it seems just a little too convenient that he is there in the pits after the disasters of Melbourne. Even so, what can he possibly achieve there without undermining whatever authority Stefano Domenicali has left? It is a complete conundrum to me. The loyalty or whatever it is that keeps ex-employees hanging around, hoping to be needed, seems without foundation to me and may even be working against the new team struggling to find its way forward. It would make more sense if Montezemolo were to make a clean break, seeing that he has decided (apparently) that Ferrari will be an Italian team once more. Let him have the courage of his convictions, say thank you and goodbye to the departees and allow them to get involved with something else. I can only presume that this strange situation is the result of Luca being a politician. He has taken the bold step of imposing his will on the team but must hedge his bets if he is not to risk castigation by the Italian media if his plans do not succeed. The likelihood is that, whatever happens to the fortunes of the team, Montezemolo will retain his godlike status in Italy and all problems will be blamed on others who failed to grasp the vision. Prime target must be poor Domenicali. As team boss, he sits very prominently on the skyline, begging to be shot at the moment anything goes wrong. Already the Italian press jostle for the best sniping position - and the hapless man has to duck by hinting at the McLaren ECU as the cause of Melbourne's problems (merely to gain time while the team found out what really went wrong). Blaming the enemy worked well enough last year but its credibility will wear thin in time and then Stefano will have to be pretty agile to dodge the bullets. His one hope must be the car. It has proved itself quick enough to deliver the goods but the continuing reliability problems must keep Domenicali awake nights. He has to knock that team into shape in very quick time, despite the handicap of old faces hovering in the background, and he can expect no help from Luca. I wouldn't have his job for anything. Why do Ferrari go through these antics? Have they not learned the lesson of the Todt years, that the team must be allowed to concentrate on their task and not be interfered with from above? Surely even Luca must be able to look back on their history and see where they went wrong before. Yet he continues to make their task more difficult with unhelpful statements to the press and allows the exiles to undermine the men that he put in their place. I'm afraid you are right when you muse about whether the Ferrari era is over. Todt was the fist that held it all together, and with the rest of the teams having preceded him out the door, I'm afraid Ferrari's glory days are over. The "Dream Team" is gone and there aren't any candidates for a re-make. But in a sense that's the character of the team. Enzo was a political animal and it affected the team top to bottom. So is Luca. When Michael was there, the team had a rallying point. Now it isn't as focused on one person, and the politics comes back into play. Sure, the team is more relaxed and fun-loving with Napoleon missing, but he got things done. I find it's similar with the road cars. They (apparently) are fantastic to drive, but they seem to have lost some of the glory and sheer thrill of beauty of the older cars. The 599 may drive like it is glued to the road, but it looks like the designers were sniffing glue and went about finding out what a rich-man's Corvette should look like. And the Enzo? Ugliest supercar ever. Or, just as likely, Luca is acting like a politician. I have this feeling that he thinks he did not get due credit with Ferrari's halycon days of 2000-2004. Almost all of the credit has gone to the Dream Team. I think he wants to leave a more obvious mark on the team, and that's by going for people who would defer to him a lot more than the Dream Team (who I see as a lot more certain of where they want to go and how to get there). What do you think, Clive? It's a sad situation for someone like me (a true blue Ferrari fan), but you seem to be right on the money as of now. Ah, the famous Tom Rubython article on Michael's retirement. I read it ages ago, Arnet, and found it extremely interesting - and it is the basis of most of the various Ferrari theories still doing the rounds of the forums. The trouble is, it's one of Rubython's and therefore cannot be trusted, despite its air of authority - he was an artist, old Tom, a writer of rare ability but not afraid to take liberties with the truth in his quest for readers. Which means we are left to make our own guesses as to what really happened and I confess that I am still undecided. But, even without Tom, it is easy enough to look at history for pointers to the future. The moving finger writes and it seems Ferrari has returned to its old ways. And that is not entirely a bad thing, as you say. At least, Ferrari produced some of the best looking production cars ever in their political years - the 1963 250 GTO is probably the greatest car built by anyone anywhere. Interestingly, it was a team effort and no single designer can claim full credit for it. I think you're right about Luca's rather sudden interest in the team, Journeyer. For years he had been the eminence grise behind the scenes but suddenly he began to appear at races the year that Michael retired - it certainly looked like he wanted his share of the limelight. I suppose it is also possible that Alonso's and Renault's two championships had shaken him a bit and he decided that the dream team were past their best. He may have opted to construct a new team before the old had declined even further - and who is to say that he wasn't right in that? But the chosen method of building a new team is flawed, I think. He seems to be selecting Italians only, instead of taking talent from wherever it appears. I have nothing against Italians (I think they build the most beautiful cars by a long way) but not all the best engineers are inevitably Italian. Luca would have done better to have kept the scope wide, rather than to please the Italian press by sticking to homegrown products. I'm aware of what Rubython's reputation is, and how many times he has been sued for libel, but it's hard to find a journalist in F1 that digs as deeply as he does. Compare his articles on, for example, the demises on the Arrows and Prost teams in the old F1 magazine (before Bernie took it over and turned it into a lad mag) and the articles in today's F1 Racing. He went beyond 20 questions and didn't seem to be affected by "celebrity." Matt Bishop came closest, but he's gone now. I guess it's up to us to dig out the truth! Tom did what I do, Arnet - gathered as much information as possible and then made educated guesses as to what was really going on. The trouble is (and the reason for him being sued so often) that he presents his findings as facts, instead of admitting that they are conclusions that might or might not be correct. Knowing as much as he did, he was often right but he left himself open to litigation when he got it wrong. And he also made it impossible for us to trust him - we could note what he said and take it into account in our own calculations, but we could never rely on him. I agree, however, that life was much more interesting with him around! Perhaps its only me who thinks that Luca's actions in the past couple of years have been for the greater good. Schumi was brilliant. agreed. What would have happened if Luca danced to the Schumi and Todt's tune in 2005? Ferrari would have been in the situation that Renault was in last year, without a star driver to even hope for fighting for the championship. Likewise, who is to say that Baldiseri, Domenicali and all the second line of command people would not have left the team had Todt been allowed to continue? Todt was a brilliant team boss but after 10 hard working years team members deserve their recognition to stay motivated even if it was at the cost of Todt's ego. Todt wanted to stay at the limelight till he thought it was appropriate and even started a small cult for him with Massa and Nicolas being slowly integrated into the team. Luca perhaps realized that this might adversely impact the "structure" that Ross Brawn spoke about yesterday. I think he has made two very important decisions with long term in mind which might affect them in short term. I am a great believer in the idea that good decisions are never popular decisions and its not like the dream team were successful from the word go. The new leadership will learn from their mistakes and when they do, it will be demoralizing for the competing teams. Give them some time and they will prove their worth. That's what I meant when I said I don't really know what Luca is doing, Uppili. It has to be too clever for me to understand or the man's stupid - and he certainly isn't. I just think that he should keep the old timers away from the team now. They are only there to remind everyone of how great they once were and to make us think that things would be fine if they were still together. Best to send them off into retirement properly so that the new team can develop in peace. 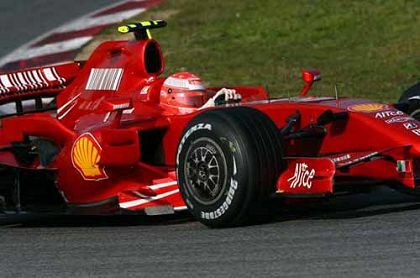 Even in their worst years, Ferrari were always a factor that other teams had to take account of. I'm sure that will continue to be the case but, at least for a while, I don't think they will be the overpowering force that they were during the last decade. It was interesting to see that Todt was wearing a black t-shirt, not Ferrari gear. Interesting to hear Pat Symonds. He was asked his opinion about whether the absence of figures including Jean Todt, Michael Schumacher, Ross Brawn and Rory Byrne will have a tangible impact on Ferrari's continuing success into the future. "But what I felt last year when Ross took his sabbatical was that when everything is going well they'll be okay, but the real test of character is when things are not going so well. "The Latin temperament has been known to melt down a little under those circumstances. "With Stefano and Aldo they do have some very level-headed, very calm, thinking people, but they are just two guys in the team. "There are an awful lot of others who might start digging for excuses, looking for a way out, and if that happens, things can go wrong pretty damn quickly," Symonds added. You ask" "Why Ferrari go though all these antics?" In my mind it's quite simple. In the post Michael & Company era, Ferrari is returning to its Commendatore-driven roots. Clive, the truth is we can not help but compare this new leadership to the past because of how good they were. And i don't think it would matter whether Todt was hanging around still or not. The comparisons are inevitable. For that matter i don't expect these comparisons to vanish if a leadership change is to happen in a team like Mclaren or even Williams. Very true, Uppili - and I'd probably be watching changes in other teams just as closely! Matters are not helped if the impression Stefan Domenicalli gave at a post-qualifying ITV interview last race is accurate. He evaded a simple question - "Would you have been able to repair Kimi's problem before Q3 had he made it to the pits?" - with some of the worst flailing I've heard since the infamous Canada 2003 press conference. If Stefan had been playing it straight, he'd have known that it was a simple "yes or no" question and that any team boss who cared about his team's appearance in the press would simply have said "yes". After all, nobody could have proved otherwise. Thank you! Not for anything new, but for so competently reminding the nay sayers of your predictions. While all will eventually be sadly missed, Ferrari’s current problems bring another refugee to mind. Shouldn’t Paolo Martinelli be included in this dream team? As for Paolo Martinelli, you're quite right, I should have included him - we tend to forget that there were many Italians in the dream team. I think it's deeply imbeded in their Italian and Ferrari DNA.